We admit, we're kind of smitten with our MACLAREN'S Cheese. So it's only natural that MACLAREN'S is the base for our super-quick spread. Top it with toasted nuts and serve with crisp crackers for a show-stopper appetizer. Combine 1 tub (250 g) each softened MacLarens Imperial Sharp Cold Pack Cheddar Cheese and Philadelphia Cream Cheese Product. Add 1 tsp. each freshly ground black pepper and dry mustard; mix well. Stir in 2 Tbsp. Port wine, if desired. Spread into serving dish. Cover and refrigerate 2-3 hours to blend the flavours. Garnish with 1/4 cup chopped toasted pecans. 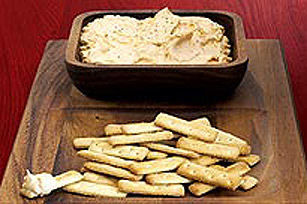 Serve at room temperature with Ritz Sticks.